It all started, as you may have read on the home-page, with a small book that I found at a junk market. 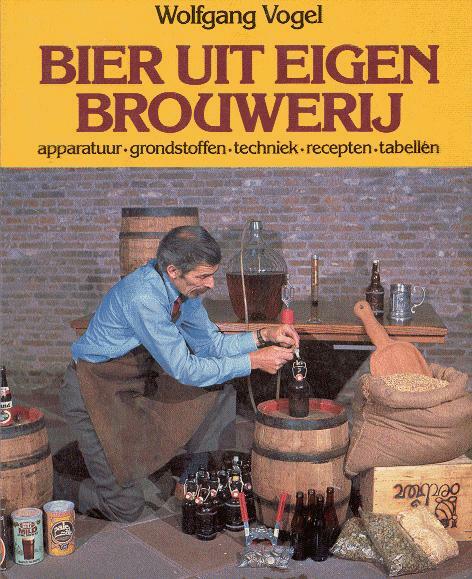 It was called "Beer from your own brewery" (in Dutch) from Wolfgang Vogel and translated and edited by Jan van Schaijk (ISBN 90-215-1348-X). It gave a complete description of how to make your own beer. It discouraged me a little, since you needed some equipment and the brewing process sounded difficult to me. For several years the book was on my book-shelf doing nothing. Until... a colleague told me that he made beer himself. And he used ready-made beer kits. That got me started! 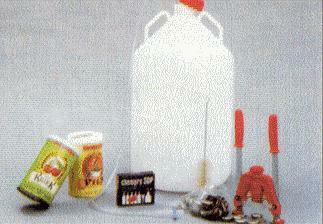 The nice thing of these beer kits is that it is relatively simple to produce your own beer. You need a fermentation bin, a decent pan, detergent, a crown capper and a siphon. 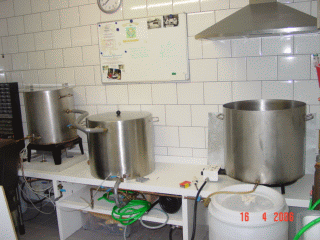 The beer kit contents are added to water which you boil for a few minutes. Cool it down and put it in the fermentation bin. Add some dry yeast, place the air-lock and let it rest for a few weeks. It is great if you see activity in the air-lock! After a few weeks you siphon the beer in sterilised bottles. I made my first beers this way (May 1999). It was a Grand Cru. The result was fantastic! A nice and strong beer. The disadvantage was that it was only 9 litres. That was gone within a week! The Grand Cru was followed by a Prestige Abt, a Diabolo and a Triple. Finally it became time for the real thing, meaning that you start with malt and no longer with a beer kit. So I bought 5 kg malt, a copper siphon (that you can place in a pan), an immersion wort chiller and an aluminium pan (19 L). The 'experiment' was very enjoyable, it resulted in a pale ale that was very drinkable. I made my first real beer and I wanted more (August 1999). I still had a few beer-kits (an Abdijbier and a Grand Cru), and since beer is beer, I made this anyway. But it didn't come any near the real thing. So on August 21st I made my 2nd beer (9th in total). It was a bit of a problem with the pans, since 19 L is only 19 L and I only had a 6 L pan to heat my water with. So that was not very convenient. And I began experimenting: the next two beers I made with peaches and with plums. Both of them were undrinkable after 8 weeks (it turned out that they needed approximately a year before they tasted excellent!). But after 8 weeks they were very bitter. I also was that stupid to throw all the fruit in the pan. And because of that the pan overflowed. My entire barn was filled with this. And I lost a lot of potentially perfectly drinkable beer! In October 1999 I made an 'Anne Millennium Brew', named after my brewing buddy. For this, I bought a new pan (30 L), because I really needed something substantially more than 19 L. The Millennium Brew was a big success, but I was afraid that I made too few of it, so in November I made the 'Anne Millennium Dark Knockout'. The Dark Knockout was realised by adding some (ok, a lot!) sugar to the brew, thus adjusting the alcohol percentage. 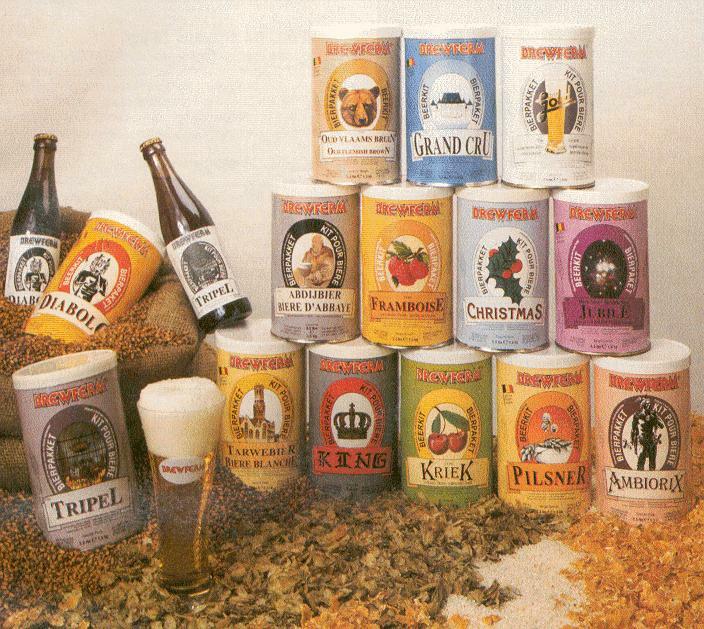 The last brews were already significant in quantity (20 litres). So I felt I needed even bigger pans. My neighbour Leo worked at a ship-yard and he said it wouldn't be a problem to create a big one for me. And indeed the next day he unloaded a 70 litres (!) pan from his car. It was a beauty! There was only one slight disadvantage: he used 3 mm stainless steel plate, which made the entire pan very heavy. And since you need a big burner that goes with this pan, I had another go to the shop and bought one. There's no doubt about it: it is great making beer with such a stainless steel pan. And so I did for several times. I made a Chimay look-a-like and a 'Kriek' twice. The annoying thing is that I couldn't make an optimum use of this pan. Because after mashing, where do you store all that wort? And how and where do you heat all that sparging water? It would be optimal if I had another two of these excellent stainless steel pans. Well, I had another chat (and drink) with Leo, drew up some sketches and calculated sizes and diameters. After a few weeks, Leo came back. From a big plate of stainless steel, Leo cut two rectangles and two circles. He had them rolled and then welded together (yeah, you need ship-yard equipment for that! Can't do that at home). I only had to pay for the stainless steel plate (which was about 150 euro). The advantage here was that the SS plate was 2 mm thick, so the pans were less heavy than the 70 L pan. And so my brewing setup was enriched with two 90 L pans at the same time. My 19 L and 30 L pans were looking a bit silly, standing next to these three pans. Nowadays, I still use the 30 L pan to accumulate the milled malt. This was also the time that my wife asked me how long I would continue with increasing the size of pans! But when the pans become bigger, you also have to clean more bottles and drink all that stuff (well, the last point is actually not a problem). After I made a few batches of 40-45 L, I realised that there is a limit when doing this alone. Cleaning bottles alone and siphoning 50 L already takes a fair bit of a Saturday.